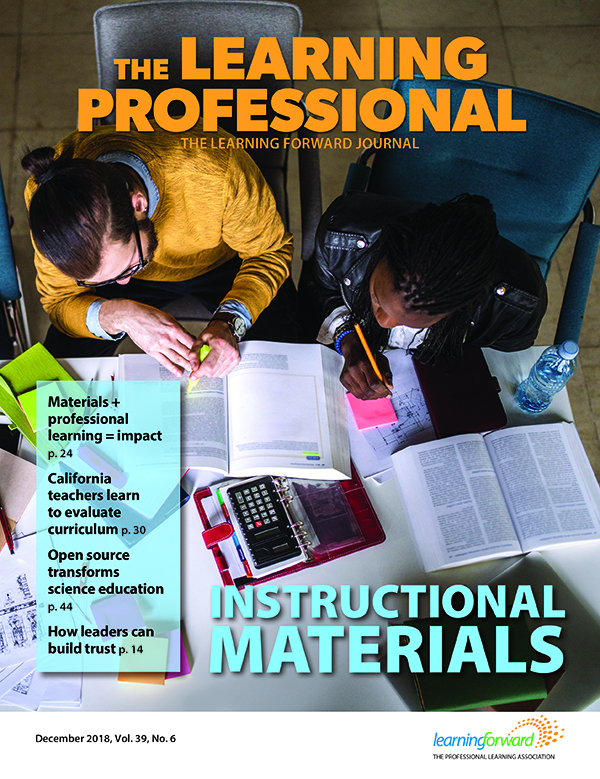 The Learning Professional explores the power of instructional materials when educators are engaged in selection and supported with meaningful, quality professional learning. Selecting high-quality instructional materials is central to supporting teacher and student success, but, as we’ve argued before, simply choosing great materials is not enough. To ensure materials become one of the most crucial tools educators have to improve student learning, educators must be engaged in selection, must understand why materials were chosen, and must be supported with ongoing professional learning. Learning Forward’s December edition of The Learning Professional makes a similar case for the power of quality instructional materials when coupled with meaningful professional learning throughout adoption and implementation. We are so honored to be included in this issue because it signals a new era in the way we think about instructional materials. No longer can we regard textbooks in isolation without consideration for quality or how materials will impact instruction. Instead our learnings have illustrated that instructional materials are most effective when they are seen as part of the larger whole: when they are standards-aligned, when educator voice and expertise is effectively harnessed during curriculum adoption, and when teachers are truly supported in using the materials to best meet the needs of all students. Most of the conversations about materials end up being about the adults buying and teaching the curriculum. We recommend flipping this conversation to be about what students deserve: How will these materials support student learning? What professional development or resources will we need to ensure our students receive the very best? As part of the December edition, we worked closely with Newport-Mesa Unified School District (NMUSD) and the Orange County Department of Education to co-author Beyond Buy-In: Teachers Learn to Evaluate and Adapt Materials which details NMUSD’s 2016 math adoption and the role comprehensive professional learning played in its success. Respect, trust, and elevate teacher voice. Remember that the adoption and implementation process is about the students. Prioritize what matters most. Not all aspects of high-quality materials are of equal importance. Structure your decision-making and plan for consensus-building early. Plan for and model responsive professional learning. Read more about each recommendation. As you dive in to Beyond Buy-In and the other articles in The Learning Professional, the shared theme of putting students first arises again and again. From these stories, we see that educators are the ones working to usher in this new era for our nation’s classrooms: one where teachers are supported with the resources they need to help students thrive, one where diverse voices are valued and listened to, and one where access to high-quality instructional materials is a reality for every kid in every school.